July 2013, Pontiac Michigan teen receives natural life sentence, first since Miller Supreme Court ruling. GRAND RAPIDS, MI – Kent County Judge Mark Trusock wants to know sooner rather than later whether a U.S. Supreme Court ruling banishing mandatory life sentences for juveniles will have an impact in his courtroom. Perhaps one of the foremost cases that could be affected is that of Saulo Montalvo, who in was convicted for the 1996 robbery of the former Westside Beer Kooler at 854 Alpine Ave. NW that led to the clerk’s murder. Montalvo drove his 15-year-old friends, Christopher Peltier and Robert Maze, to the party store and waited in the car while Maze shot and killed the cashier, 61-year-old Rodney Corp, and Peltier scooped up the money. After a trial, former judge Dennis Kolenda sentenced the teens to life in prison without the possibility of parole for felony murder and armed robbery, and two additional years for possession of a firearm in the commission of a felony. Kolenda hoped the parole board, courts or governor’s office might reconsider Montalvo’s mandatory sentence at some point, but after 16 years that has not happened. But in June (2012), the Supreme Court ruled in a case called Miller vs. Alabama that juveniles cannot be sentenced to mandatory life without the possibility of parole. The 5-4 vote will significantly impact Michigan, which is second in the nation in the number of inmates serving life sentences for crimes committed by those 17 and younger — more than 360. There are about 2,500 nationally. Kent County alone has 22 defendants that could be affected, according to Circuit Court Administrator Jack Roedema. Those cases include well-known murders involving teens such as the 1996 case of Federico Cruz, the 1981 case of David Samel, the 2003 cases against Jon Siesling and the 2008 case against Mike Zuniga. Kent County Prosecutor William Forsyth says while there may be some cases that are affected, there are those he believes are to egregious to have a life sentence overturned. Those cases include that of Cruz, who decapitated his victim, and Siesling, who brutally killed his mother and siblings in their Walker home. “I can’t fathom any judge in the state of Michigan would consider the possibility of allowing these people to get out of prison,” said Forsyth, who prosecuted six of the 22 Kent County juvenile lifers. Still, while he declined to name specific cases, he said there are some defendants in Kent County who may well benefit from the ruling. The Supreme Court majority held that the Eighth Amendment forbids sentencing schemes that require life in prison without possibility of parole for juveniles. The Eighth Amendment prohibits cruel and unusual punishment. When Trusock was elected in 2007, he took over Kolenda’s docket, meaning he inherited the Beer Kooler robbery and murder case. “The Supreme Court’s decision has placed the validity of the defendants’ sentences in doubt,” Trusock wrote in a letter to State Attorney General Bill Schutte. “This court is taking a proactive approach in the matter for two specific reasons – first the court is concerned about the family members in these cases,” Trusock wrote. Trusock said the defendant’s due process rights are also an issue. “If (the convicted people) are entitled to resentencing, they are entitled to such in a reasonable, timely fashion,” Trusock wrote. Trusock has scheduled a hearing at the downtown court building for Sept. 28 in order to address whether the ruling applies to this case and if so, are they entitled to be resentenced on all charges or just the felony murder? Trusock said the three defendants will be assigned attorneys; the prosecutor’s office will also weigh in. Forsyth said he approves of taking a proactive approach, but believes it needs to be more comprehensive. He favors having all the local judges gather and fashion an approach to these cases. “I’d like to do it at one time so everybody’s using the same rules, the same game plan, if you will,” Forsyth said. 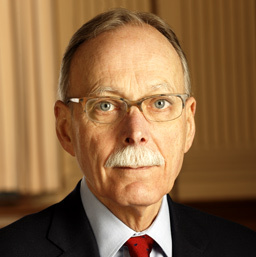 Forsyth points out that while a mandatory sentencing scheme is overturned by the decision, the life sentences can be reaffirmed on a case-by-case basis. Offender states he knows he does not deserve to ever be free. 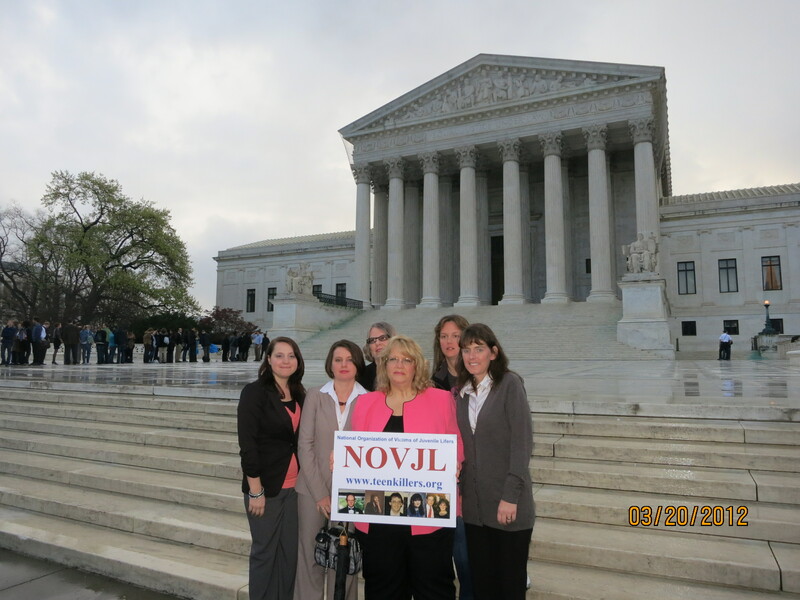 This case we find a fascinating example of what NOVJL had predicted with much of the legal wrangling and money spent on trying to free some of the teen killers nationally, including the Supreme Court rulings: even when they get to go back to court, they are given the same life sentence! Tia Skinner, the teen convicted of murdering her father and trying to kill her mother in a 2011 knife attack, is pictured center. PORT HURON, Mich. -A young woman convicted of plotting a fatal stabbing attack on her father has again been sentenced to life in prison.Tia Skinner was given a no-parole sentence in 2011 when, at 17 years old, she was convicted of first-degree murder in St. Clair County. But she had another day in court Thursday after the U.S. Supreme Court struck down mandatory no-parole punishments for teenagers.But Judge Daniel Kelly issued the same sentence for Skinner, who is now 20, calling her “the architect” of the plan to attack her parents.Two men attacked and killed Skinner’s father, Paul Skinner, in their Yale home in November 2010. Her mother was seriously wounded. The former honors student said Thursday that she loves her family and acknowledges she could have stopped the attack. http://www.myfoxdetroit.com/dpp/news/local/demarco-harris-sentenced-20100617-wpms – see the video of the sentencing hearing. DETROIT – He was just twelve years old when he pulled the trigger killing a young woman during a botched robbery. Thursday, that young killer was spared from spending his life in prison. There was very emotional testimony Thursday inside the Lincoln Hall of Juvenile Justice. The father of the victim spoke out about the immense loss of his daughter. The suspect’s mother also told the judge to blame her for what her son did. “Blame me. Blame me,” Nakeya Harris said as she begged a judge to show mercy on her 13-year-old son. The desperate plea happened just before her son was sentenced for the murder of 24-year-old Trisha Babcock. Police say the Flint-area woman was in Detroit on a job hunt. She was sitting in her car at West Outer Drive and Minock when Harris, who was twelve at the time, tried to rob her. He claimed she grabbed for his gun and it went off. He ran as she bled to death. “Thinking about how horrified and terrified my daughter was,” said Steven Babock, the victim’s father. A day that has forever changed her father. He tearfully held up pictures of Trisha, explaining his pain as a parent. “I’m never going to be able to give my daughter away on her wedding day. I’m never going to be able to hold her grand baby. You took my bloodline. You took my little girl, Trisha,” Babcock said. He wants his daughter’s killer to pay — a teen who spent much of his young life in trouble with the law. “Bring justice for my daughter Trisha, who by the way, I was told that this boy should’ve never been on the street to begin with,” said Babcock. Just before the judge handed down the sentence, Harris himself got up and apologized to the court. “Sorry for having you all go through this. I know your all heartbroken because if somebody took my sister’s life, my heart would be the same way as yours,” said Demarco Harris. The judge could have sentenced Harris as a juvenile or as an adult, which meant a mandatory life sentence. Instead, she choose a blended sentence. A chance for Harris to change his ways. That blended sentence basically means Demarco Harris will serve his time inside a juvenile detention facility until he is 21. If he is good, he may be able to walk free at that time. If not, the judge could send him to prison for life. Two Pontiac 15-year-olds were sentenced in December 2009 to life in prison for the beating death of a homeless man. Dontez Marc Tillman and Thomas Jay McCloud Jr. are currently not eligible for parole. The controversial topic of juvenile offenders receiving life-without-parole sentences will be in the spotlight when attorneys for the American Civil Liberties Union argue that such sentences constitute cruel and unusual punishment. Late last year, a lawsuit was filed against Michigan’s governor, the director of the state’s department of corrections and the chair of the Michigan Parole Board on behalf of nine people serving lifetime sentences for crimes they committed when juveniles. Attorneys for the state defendants have cited in court filings a number of reasons why the case should be dismissed, including that the plaintiffs’ constitutional challenges asserted in the lawsuit could have been raised in their respective state court criminal cases and appeals. The motion cites a U.S. Supreme Court case in which the court rejected the argument that mandatory penalties, including life imprisonment without parole, are unconstitutional. 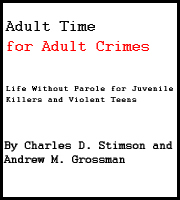 It also goes on to say that the constitutionality of life without parole sentences for juvenile homicide offenders was reaffirmed in the U.S. Supreme Court case of Graham v. Florida. “Individuals of whatever age who commit homicide are different than all other offenders in terms of the nature of their crime, and are deserving of the most severe forms of punishment, i.e., a life sentence without the possibility of parole as compared to a non-homicide offender,” the motion reads. A hearing on the defendants’ motion to dismiss the lawsuit or, alternatively, for summary judgment is scheduled before U.S. District Judge John Corbett O’Meara in the federal courthouse in Ann Arbor. Some people view lifetime prison sentences as a useful law enforcement tool and a deserved punishment for the most serious of crimes. Others disagree, fueling a movement to end lifetime prison sentences for juvenile offenders. According to the Michigan Department of Corrections, in 2009, there were 485 people serving lifetime prison sentences for crimes committed when they were 17 or younger. Of those, 139 people had a chance of being paroled, while 346 offenders were serving sentences without the possibility of parole. In Michigan, a conviction of armed robbery, first-degree criminal sexual conduct or other serious crime that is categorized as a capital offense carries a maximum penalty of life or any term of years in prison. A conviction of first-degree murder carries a mandatory sentence of life in prison without parole. Prosecutors have the discretion to charge people ages 14 and older as adults in cases involving serious crimes, a procedure called an automatic waiver. If someone 14 or older is convicted of first-degree murder, a judge must sentence that person to life in prison without parole if the defendant was charged as an adult. If someone younger than 14 is charged with a capital offense, the prosecutor can still designate him or her as an adult, but the judge has discretion in sentencing and can sentence that person as a juvenile, an adult, or blend the sentence. McCloud and Tillman were each convicted of first-degree felony murder for the death of 61-year-old Wilford “Frenchie” Hamilton. Hamilton was discovered with severe wounds next to a trash bin in an alley near the Crofoot Ballroom on Saginaw Street. McCloud was convicted of a second count of felony murder for the death of 65-year-old Lee Hoffman, who was also homeless. Hoffman was found in a small park off Saginaw Street, between Lawrence and Pike streets. McCloud and Tillman were 14 at the time of the crimes and had no prior criminal history. Neither one is involved in the ACLU lawsuit against the governor and other state officials. Eight men and one woman sentenced to life in prison for crimes committed when they were under age 18 are being represented by the ACLU, whose lawyer, Deborah LaBelle, is trying to argue that their life sentences for murder are violations of the 8th amendment. One of the inmates is Henry Hill Jr. In addition to Hill, the ACLU is representing Damion Todd, 42; Jemal Tipton, 42, Bobby Hines, 37; Bosie Smith, 35; Jennifer Pruitt, 35; Kevin Boyd, 33; Mathew Bentley, 28; and Keith Maxey, 20. This is a copy of a photo of James Cotaling. He was brutally stabbed to death 20 years ago in Pontiac. His murderer is now being considered for clemency by Gov. Jennifer Granholm. James Cotaling’s family members got shocking news: One of the convicted killers, Barbara Hernandez, had been granted a public hearing on her petition for commutation. 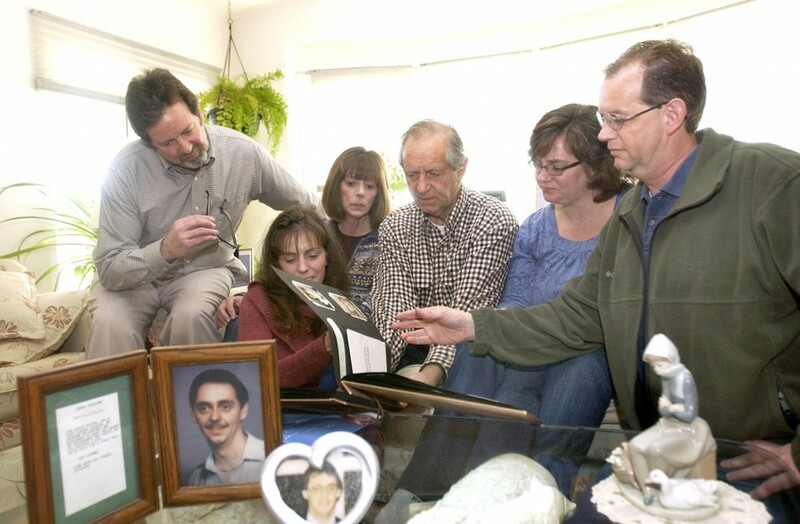 The family members of James Cotaling (photo above) look through a family photo album remembering some of the good times. Their brother and son, James Cotaling was brutally stabbed to death 20 years ago in Pontiac, and now his murderer is now being considered for clemency by Gov. Jennifer Granholm. The family, needless to say, is very upset about that possibility. Family members (L-R) are brothers & sisters, John Cotaling, Jody Robinson, Roberta Featherstone, Jack Cotaling (father), Christine Cook, and Jeff Cotaling. 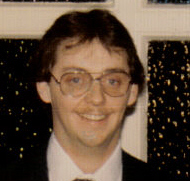 James Cotaling had been missing for three days in May 1990 when his stabbed body was discovered under blankets in a corner of a house in Pontiac. Two people were convicted of murder and given lifetime prison sentences. Earlier this year, Cotaling’s family members got shocking news: One of the convicted killers, Barbara Hernandez, had been granted a public hearing on her petition for commutation. 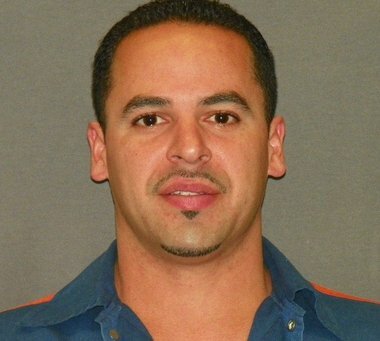 The hearing was last month and now the parole board will make a recommendation to Michigan Gov. Jennifer Granholm, who will decide whether to grant a commutation request. Family members of the victim say they are especially worried that Hernandez will be freed because Granholm has granted an increased number of commutations in recent years. According to Granholm’s office, the governor has granted a total of 141 commutations and five pardons. She granted two commutations in 2003 and 2004, three in 2005, two in 2006 and nine in 2007. The numbers jumped considerably higher in 2008, when 45 commutations were granted. Granholm gave 57 commutations in 2009, and 21 so far in 2010. Tiffany Brown, a spokeswoman for Granholm’s office, said in an e-mail that those commutations included 34 people who were convicted of first-degree murder and five people who were in prison on convictions of second-degree murder. Sixty-four commutations, including 15 of the 39 murder commutations, were granted for medical reasons, Brown said. She also said 25 of the commutations were issued to foreign nationals in state prisons with immigration detainers. Twenty-four of the 141 people with commuted sentences have since died. Generally, prisoners or someone acting on their behalf have to apply for a clemency review. Twelve clemency hearings have been held so far this year, with 10 more scheduled through April, according to the Michigan Department of Corrections. Brown said the increase in commutations is a result of two changes Granholm has made to the clemency process. In February 2007, Granholm created the seven-member Executive Clemency Advisory Council to help the Michigan Parole and Commutation Board with its review process. The governor asked the council to give priority to applications from prisoners who are medically frail, nonviolent elderly inmates or foreign nationals who would be deported when they’re released. The governor is focused on prisoners who would not be a risk to public safety, Brown said. Brown said none of the commutations were for budgetary reasons. John Cordell, a spokesman for the Michigan Department of Corrections, said the MDOC has a roughly $2 billion budget. He said $120 million was cut out of the department’s 2009 budget, resulting in the closure of three prisons and five camps, and the loss of about 5,400 beds. State officials have been grappling in recent years with declining tax revenues and other budget challenges. “We’re one of four states that has a larger corrections budget than a higher education budget. I don’t think anyone sees that as a positive,” Cordell said. On May 12, 1990, 28-year-old auto mechanic James Cotaling left his house in Auburn Hills and headed to Pontiac to buy a Mother’s Day card. He encountered Hernandez in the city. Posing as a prostitute, she lured him to an abandoned home she shared with her boyfriend on Howard Street. Cotaling was stabbed more than two dozen times and nearly decapitated. Hernandez, who was 16, and her older boyfriend, James Roy Hyde, were arrested in Ohio the next day. The couple had Cotaling’s vehicle. Hernandez confessed. According to past Oakland Press stories, Hernandez testified that Hyde had instructed her to buy a knife and then get someone to come back to the house so they could steal his car. Hyde and Hernandez were convicted on murder and robbery charges. They were sentenced to life in prison. Officials with the Michigan Women’s Justice & Clemency Project have kept track of Hernandez and filed petitions for clemency on her behalf. Carol Jacobsen, director of the Justice & Clemency Project, said Hernandez had a horribly abusive home life and was preyed upon by Hyde, who had threatened her. Hyde, not Hernandez, was the killer, she said. “She takes responsibility for being there, for buying a knife, which (Hyde) forced her to buy for him. … She was a 16-year-old kid, runaway, abused and under horrible duress,” Jacobsen said. Cotaling’s family members believe the evidence shows Hernandez took part in the murder. And, they say she has not exactly been a model prisoner. From 1997 through 2007, Hernandez has had 17 misconduct reports for such things as disobeying a direct order, fighting and introducing a controlled substance into a correctional facility. “She should stay locked up forever,” said Roberta Featherstone, a White Lake Township resident and Cotaling’s sister. On March 15, a five-hour commutation hearing was held at the G. Robert Cotton Correctional Facility in Jackson. Jody Robinson Cotaling said prosecutors from the Attorney General’s Office and Oakland County Prosecutor’s Office were present. Two dozen of the victim’s relatives also were there, and some spoke to the parole board. Hernandez was questioned and denied stabbing Cotaling, but also gave inconsistent answers about her involvement, Robinson Cotaling said. The next step is for the parole board to meet and vote on a recommendation to the governor. If Granholm decides to grant the commutation request, the board votes on a parole. If the board votes to grant parole, the parole term would be for four years. Jacobsen said she is not only pulling for Hernandez to have her sentence commuted, but she believes in general that there haven’t been enough commutations. “Our state spends more on prisons and corrections than almost any other state. We are a terribly punitive state, and we cannot afford it,” she said. Featherstone said waiting for an answer from the parole board isn’t easy. “It’s just not knowing that somebody out there might get a second chance, and my brother never did,” she said. James Cotaling, who was called Jimmy by family and friends, was one of seven children. He loved skiing and cars. His family members say he was always smiling. Jack Cotaling, a 75-year-old White Lake Township resident, keeps a picture of his son on his bureau. There’s also a note there written by the director of the ski school at Pine Knob who said James was a caring ski instructor who brought excitement and happiness to many people. Jack Cotaling looks at his son’s picture every morning. “Some mornings I say, ‘What should I have done different?’ I blame myself,” he said, his voice breaking. Jack Cotaling said when his son’s killers were sentenced to life in prison, the family felt a sense of closure that’s now being threatened by the possibility that Hernandez could one day be released. ED NOTE – Gov Granholm denied clemency to Ms Hernandez, and the arguments used to attempt to minize her culpability in the crime have been refuted. Ms Hernandez was proven through much physical evidence to have actually held Mr Cotaling down and repeatedly stabbed him with a filet knife. Raymond Carp, left, and Keith Maxey are serving life without parole. A Supreme Court ruling ends such automatic sentences for juvenile convicts. Sixteen-year-old Keith Maxey was in an abandoned house on Detroit’s east side about 2 p.m. Dec. 24, 2007, when his friends, both in their 20s, tried to rob four young men who went there to sell them a pound of marijuana. Brian McClendon Jr., 20, of Detroit, who was with the sellers, was shot to death, and a companion was seriously wounded. Maxey, who was unarmed, also was shot repeatedly in the chaos, and later said he had no idea his friends were planning a robbery. But he’s now in prison for life with no chance of parole. Raymond Carp was 15 when his half brother, Brandon Gorecki, 22, beat and stabbed 43-year-old Maryann McNeely to death in her mobile home in St. Clair County’s Casco Township on May 31, 2006. Gorecki testified at Carp’s first-degree murder trial that he, not Carp, killed McNeely. But a friend testified that Carp made incriminating statements about handing Gorecki the knife and holding McNeely down. Carp is now serving life without parole. Now Maxey and Carp, along with 356 other juvenile lifers in Michigan, could get a shot at eventual freedom because of a June decision by the U.S. Supreme Court that struck down automatic mandatory life sentences without the possibility of parole for juveniles convicted of murder. The high court, in a 5-4 decision, said such juvenile life sentences violate the Constitution’s Eighth Amendment ban on cruel and unusual punishment. Maxey may be among the first in Michigan to benefit from the ruling. U.S. District Judge John O’Meara is expected to rule any day on the state’s motion to dismiss an American Civil Liberties Union lawsuit challenging his sentence and the life terms handed to other juvenile killers. Defense and appellate attorneys and the ACLU of Michigan say Maxey and Carp are among the types of defendants who don’t deserve to die in prison: juveniles only peripherally involved in homicides; under the influence of peers or adults; ill-served by their lawyers, or unaware of their own best interest in pleading guilty to lesser charges with shorter sentences. The Supreme Court ruling will require judges to consider the background of juveniles, the circumstances of their crimes and the extent of their involvement before imposing a sentence. After considering those factors, judges could still sentence juveniles to life in prison — and perhaps mandatory life in prison without parole, prosecutors say — but the sentences no longer would be automatic. The decision has sparked a debate in Michigan and across the nation as to whether the ruling applies to future offenders or those already in prison and whose appeals already have been exhausted. With 358 juvenile lifers, Michigan ranks second in the country behind Pennsylvania, which has 475 juvenile lifers, according to the ACLU of Michigan and Second Chances 4 Youth, a juvenile lifer advocacy group. Nationally, Michigan accounts for nearly 14% of the more than 2,600 prisoners serving life sentences without parole for crimes committed when they were juveniles. Officials in Michigan are among those in two dozen states trying to figure out how to comply with the high court’s decision. The U.S. is the only country in the world that sentences juveniles to life in prison without the possibility for parole. The Michigan battle is being waged on three fronts: In U.S. District Court in Ann Arbor, where the ACLU sued on behalf of Maxey and other juvenile lifers; before the Michigan Court of Appeals, which is reviewing Carp’s case, and in the Legislature, which will try to amend state law to comply with the Supreme Court’s decision. It’s unclear which forum will sort out the issue first. 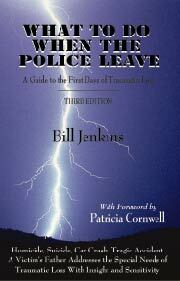 The question of how to apply the law — retroactively or only to future cases — could be decided by the ruling of a judge or an act of the Legislature. The Court of Appeals has asked prosecutors, criminal defense lawyers and other interested groups to file briefs in its case. It will hear arguments Tuesday in Lansing and try to craft a solution. A decision could take months. State legislators said they planned to introduce bills to comply with the high court’s decision after failed efforts in 2008 and 2009 to abolish juvenile lifer sentences. If the Supreme Court’s ruling applies to those already in prison, officials must then decide whether they should be re-sentenced or considered for eventual release by the Michigan Parole Board. Michigan Attorney General Bill Schuette and county prosecutors want the ruling to apply only to new offenders and juvenile lifers who haven’t finished their appeals. Applying the decision retroactively, they contend, would inflict more pain and suffering on the families of murder victims. “Hauling hundreds of crime victims and their families back into court to relive these horrific murders would be a terrible tragedy,” Schuette said in late July, when he tried to intervene in a juvenile lifer appeal before the Michigan Supreme Court in an unsuccessful bid to get a quick decision on retroactivity. The ACLU of Michigan has been trying to abolish mandatory life sentences for juveniles since 2003. It wants current lifers to be given a chance for parole. . . .
Pontiac — A Pontiac teenager was sentenced to natural life in prison Wednesday and his adult accomplice will serve 32 to 50 years for their roles in the February 2012 slayings of two Pontiac women, both shot to death over a bogus $10 bill. Separate Oakland Circuit Court juries found Semaj Moran, who turned 17 this month, and Arnold Howard, 23, both guilty in the killings following trial last February in the deaths of Loretta Fournier, 52, and Luann Robinson, 58, two long-time friends and business partners. Moran, the admitted shooter, was found guilty of two counts of first-degree murder, two counts of felony murder and four firearms charges in the deaths. Howard was convicted of a lesser offense of second-degree murder and home invasion in Robinson’s death. Morris was moved by statements from the victim’s families, who told of how the victims bought Christmas presents for the needy every year and held fundraisers in their home on Pingree to help the less fortunate. “We’re here about two extremely warm and genuine good-hearted ladies who cared for their community and opened their homes to allow young people to come in … she may have took it too far,” said Morris. Moran’s case is believed the first in Michigan involving a teenage life sentence since the Supreme Court ruling, he said. Moran was 15 at the time of the killings, noted Mitchell, who became emotional in his pre-sentence remarks before Morris. “I can’t imagine living like him and having the upbringing he had,” said Mitchell, so choked up at one point he had to pause in his remarks. In court testimony, Moran said both men were upset after Moran was given a fake $10 bill for some marijuana he sold the women and he and Howard returned to the address. Jurors heard a police interview with Moran in which he told how the pair had a plan in which Robinson would go to a bathroom and flush a toilet, a signal to kill the women. Fournier was shot three times in her first-floor apartment and Howard chased Robinson up to an adjoining second-floor apartment and during the struggle, pushed her down the stairs where she was also shot by Moran. Before he was sentenced, Moran gave a tearful apology to the victims’ families and to his own, many of whom wept openly in the courtroom.